Observation Point is one of the big hikes in Zion National Park and from what I am told has some of the best views in the park! This post will be where I drop all details pertaining to the East Mesa Trail to Observation Point hike, if you have completed this hike please share your tips or suggestions in this thread for anyone else planning on doing this hike! Mapping out the hike up East Mesa Trail to Observation Point shows its a 3.53-mile trek up with 3,219 feet of elevation gain, and then another 3.53 miles back down for a total of 7.06 miles round trip. Hiking to observation point may not be that long of a hike, but its a pretty good climb, so come prepared! 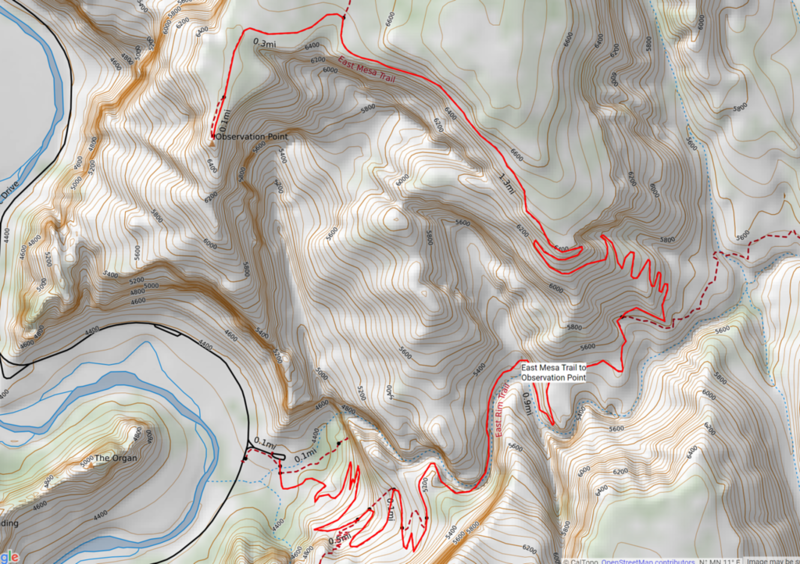 The trailhead can be found here on Google maps, and the map I created below can be viewed and downloaded from Caltopo here. As you can see in the terrain profile above this is one steep hike!